If anyone knows me, they know I’m very indecisive. I don’t like to decide what to eat, what to buy, what career to choose, what to name my children, and much more. I think it comes down to the fact that if I commit to something, if I make a decision, the other option might have been better. For most of my life I thought I would have 2 children. But then, I felt the urge to have one more. I just didn’t feel like our family was complete. I knew risks increased as we got older and I wanted the kids close in age, so we decided to have another baby and within a month, there was no going back. I felt a lot of anxiety during the pregnancy. 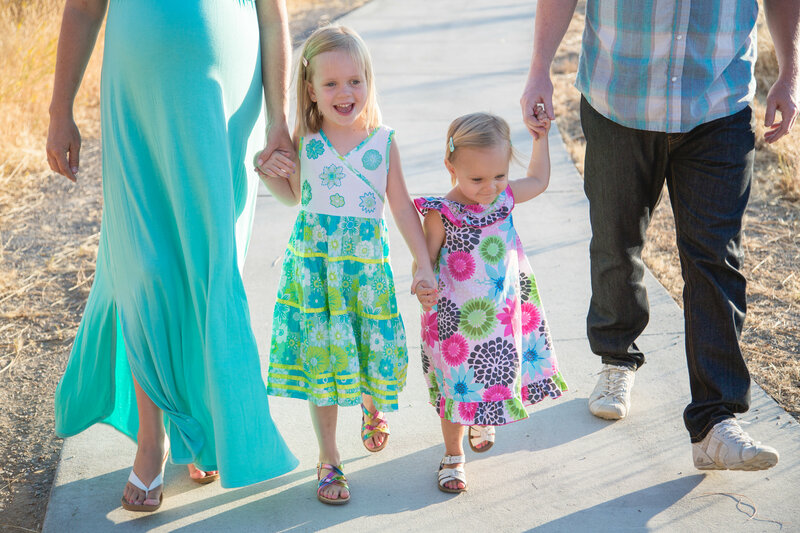 I didn’t know why–I wasn’t worried about miscarriage (like I did with our other two) or a particular illness that our baby would have and I just figured I was worried about dealing with 3 kids. I had no idea that my concerns were so minuscule compared to what I really had to face with my third as a special needs child, but the decision was made and now we are adapting and learning as we go along. Now our family is complete. The day before Kiira was born, we still had not decided on a name for our baby girl. 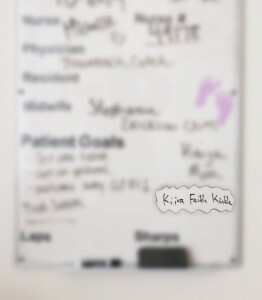 We wrote names on the white board at the hospital while I was being induced. One-by-one we eliminated them until all that was left was Kiira Faith. I told my husband I was unsure of using “Faith” as a middle name, because I felt the name was doomed. Little did I know that Kiira actually had a horrible condition that would require monumental amounts of faith for us to get through it. Her name is a constant reminder that God is with us, He is watching out for Kiira and our family and although she has RDEB, He is opening doors toward our one and only option at this time, to potentially heal her through a Bone Marrow Transplant. So it turns out the name “Faith” was a very good decision. 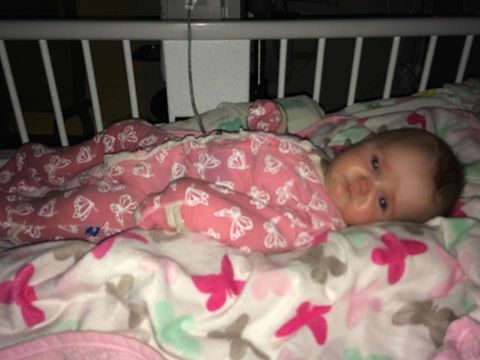 As we faced the decision about whether or not Kiira should have a bone marrow transplant, we learned that before she does, she is required to have a feeding tube. 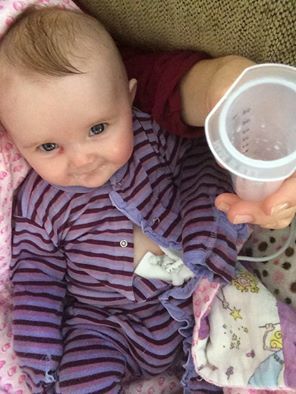 The tube will help provide her with nutrition if she won’t eat on her own during and after chemo and will allow us to administer medications. I really did not want to put Kiira through this procedure. Aside from the effects of EB on her skin, I feel like she is a healthy, strong girl. She doesn’t have noticeable reflux, her x-ray showed no esophageal strictures, and she eats so well, most of the time. 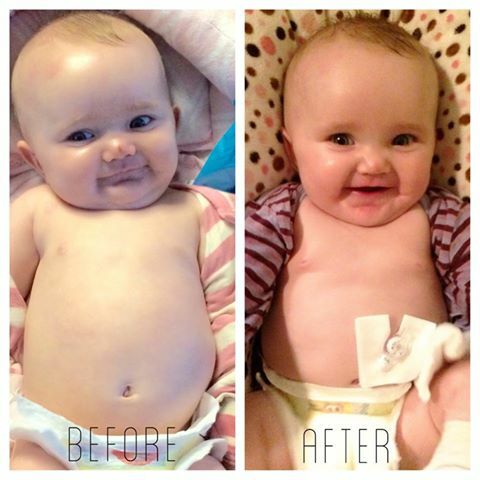 The idea of surgery to any baby is horrible, but to let someone else handle Kiira’s fragile skin, cut her, poke her, and put medical equipment on her when it could tear off her skin, was truly terrifying. 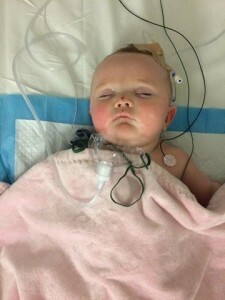 The night before her surgery, we prayed and prayed. Our stomachs were in knots with the realization is that this is probably the easiest surgery Kiira will endure in her lifetime. My heart ached, my head worried, but I kept trying to accept God’s peace that He would bring her through this. I keep repeating the verse from Philippians 4:6: “Do not be anxious about anything, but in every situation, by prayer and petition, with thanksgiving, present your requests to God.” Although I still worry and have moments of doubt about the decisions we’re making for Kiira, I know God is leading us on a journey and to accept that, and follow Him, that is one decision I cannot doubt. On March 17th, I woke up at 3am to pump milk and then fed Kiira her last meal before her G-Tube surgery. 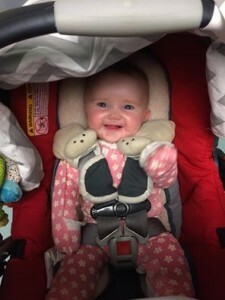 We arrived at the hospital around 8am and over the next 2 hours, we met with Kiira’s surgeon, nurses, and anesthesiologist and they all assured us that they had experience with EB patients and would take very good care of Kiira. The anesthesiologist even said they have special bags of supplies under their desk for EB patients that don’t include any tape. I rocked Kiira to sleep in my arms (which rarely happens), and then the anesthesiologist took her from my arms and off they went. My husband and I sat outside waiting. Typically a gtube surgery takes 1 hour, but because of the extra precautions the team promised to make with Kiira, they expected that it would be about 2 hours. 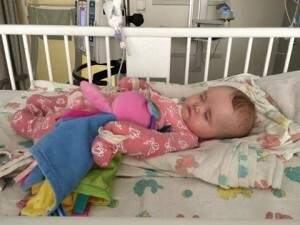 When they finally came to tell us she was out of surgery, we approached her with caution. She looked so peaceful, but it was so sad to see her with an IV in her head and an oxygen mask over her face. However, a quick view of her and I could tell they did an AMAZING job of keeping Kiira’s skin in perfect condition. I can’t thank the team that worked on her enough for protecting my sweet girl. They put in a Mic-Key button, so she doesn’t have to have the outer tubes attached all the time. It’s fairly small and doesn’t stick out too far. They used a scope through her belly button, so at least there isn’t an extra hole or scar. As she started to stir, she whined a little bit and sounded really hoarse. We tried to keep her IV in her head, but without tape, we knew it wouldn’t last long. In fact, it came out as soon as the nurse raised the bed rail to move her upstairs. Since they didn’t want to replace it, we needed to keep an eye on her hydration, but she couldn’t eat again until 8pm. 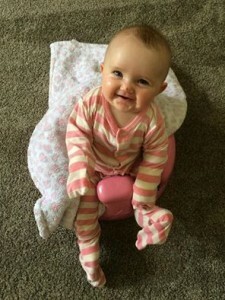 From 3:30am to 8pm is a very long time to keep a baby from food! Kiira fussed on and off throughout the day, but mostly slept. We skipped her bandage changes since we felt she had been through enough that day. Around 4:30pm, Jason left to get our other daughters and I stayed with Kiira. We were both exhausted, but sleeping in a hospital is hardly restful. Nurses come in and out and Kiira woke a few times to eat since she didn’t eat the day before. I finally got up around 7am. Kiira had more energy and was content, but didn’t seem to want to eat much. She didn’t have a wet diaper all day and only took about 5 oz of milk total through the whole day, when she usually drinks 5-6 oz per feeding. A nursing student helped me change bangdages and I had a long discussion about EB with her instructor. She challenged me to allow Kiira more freedom with her hands. What good is protecting her skin if she can’t use it? 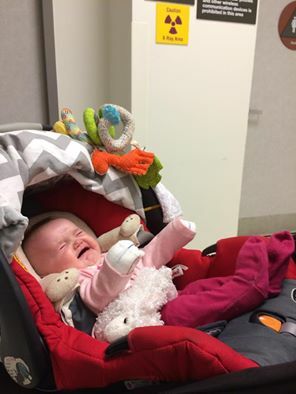 I know, I know…it’s this inner battle that I have–allow her to scratch herself and blister her fingers and face, but start learning how to grasp toys, or protect her skin for another few months until we get her BMT? I keep assuming she’ll catch up, but the more I watch her trying to play, the more I feel bad for not letting her. Yet another decision, I cannot make. 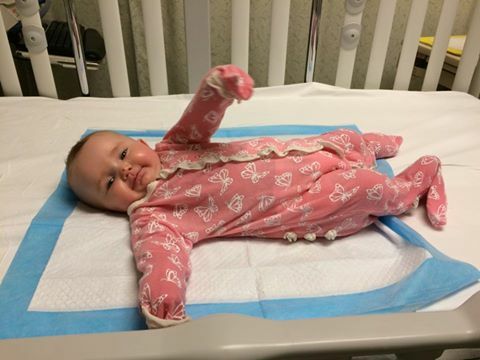 We fully expected to go home that day, but sometimes things don’t go as planned–so we ended up in the hospital for another night since Kiira just wouldn’t eat enough. Jason brought dinner and the girls to visit us that night, and Kiira was so excited to see them. She gets a big smile on her face and giggles at them. It’s really precious to watch. That night I watched a video about how to use the gtube and then got some much needed sleep while the nurse quietly fed Kiira through her gtube every 2 hours through the night. I didn’t even know she did that since she let me sleep! That morning, we got her to take some milk out of a bottle and I put the rest in the tube. It’s weird to watch the milk go through the tube into her tummy, and sometimes it comes back out (and overflows all over you, which is really gross). The surgeon came by and showed me how to use the gtube and how to care for it. It’s so odd to me to have this thing in her that goes into her tummy. I know it’s life-saving for so many, but it just seems to unnatural and invasive. I’m scared it will fall out for some reason, which would completely freak me out, and is very dangerous if it happens in the next 6 weeks. Kiira did get the ok to roll over now, so we have let her do that some. It still makes me nervous, and she seems a bit uncomfortable, but I’m sure she’ll get used to it in no time. We were thrilled that the doctor gave us the ok to take her home. We didn’t get discharged until about 4pm, but we were so ready to be home. As soon as we got home, Kiira ate a full bottle and slept through the night and got back on schedule with feeding and sleeping. This girl just loves the familiarity of home and family! Her sisters were thrilled to have her home and I was ready to sleep in my own bed! I know this was just a very small taste of what it will be like in MN, but only 3 days and it’s exhausting. I sure hope God gives me more strength when we’re there! It turns out that I am thankful for this gtube. I never planned to use it but about a week later, Kiira had a blister that covered the entire left side of her tongue, making sucking on a bottle very painful! I couldn’t bear to hear her screams and see her tears falling, so we have used the feeding tube a few times over the past couple of weeks when this happens… If any of you read my last blog post, you know I freaked out about her nose, which is nothing compared to so many other kids with EB. It ended up healing beautifully, so I know her tongue (and the scratch by her eye) will too. The cuts around her tube are healing well too and we just have to clean it with water and gentle soap and flush the tube with a little bit of water each day. 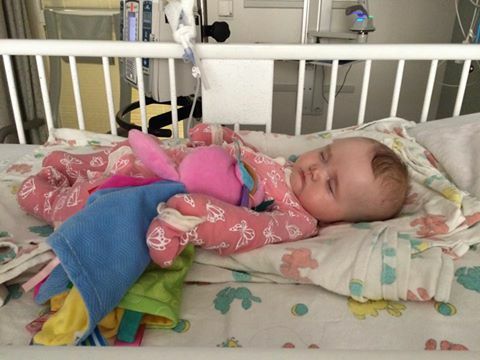 Besides the amazing care Kiira got from her doctors, I’m also thankful for Kaiser insurance. We just received the letter of approval from them, which means the BMT is financially covered! Our next step is to do another blood draw (10 vials!) to do more extensive HLA blood typing to make sure the donor they found really is the right fit. In the meantime, we’re still waiting for approval from the board MN uses. As we see the sores in her mouth more frequently and we face this decision about giving her the use of her hands versus keeping them protected, we feel the BMT can’t come soon enough! We have now set out on this path; we’ve made this decision to pursue the BMT, but just because I have faith that we’re making the right decision, doesn’t mean I’m not scared. All we can do is pray that this decision gives Kiira the chance at a more normal, less painful life.